Oklahoma City Thunder shooting guard Thabo Sefolosha (25) during the second quarter against the Minnesota Timberwolves at Target Center. Timberwolves won 100-81. Thunder guard Thabo Sefolosha was in the starting lineup for Oklahoma City on Sunday night after missing three games because of a sprained right knee. 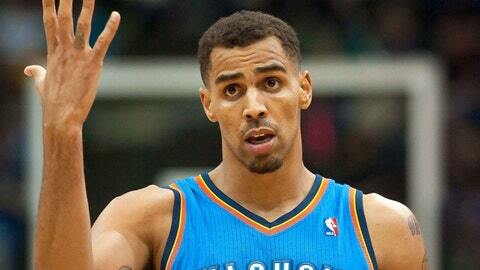 Sefolosha last played on Dec. 8 in a win over the Indiana Pacers. He’s started every game this season in which he’s been healthy, and was ready to play against Orlando. The Thunder had called up rookie Andre Roberson from the NBA Development League’s Tulsa 66ers to fill in as a starter for Sefolosha. Oklahoma City coach Scott Brooks said Roberson likely will have his playing time significantly curtailed as a result of Sefolosha’s return.